Lottoland's Crowd Cam was a huge hit during Manly's clash with the Roosters on Saturday night as one lucky winner took home a lofty $900! The first Manly Sea Eagles home game of the season saw dreary conditions with torrential rain teaming down for most of the game, but that didn't ruin one very lucky ladies night as she scored $900 as first Lottoland's Crowd Cam winner! During the halftime show, Lottoland's Crowd Cam panned over to "Jay" and the countdown from $1000 began! She quickly noticed that the camera was on her and managed to scoop $900 for her troubles! Not bad for a Saturday night! Jay was all the way down from Queensland to support Manly in their first home game and her loyalty was certainly rewarded! What is Lottoland's Crowd Cam? 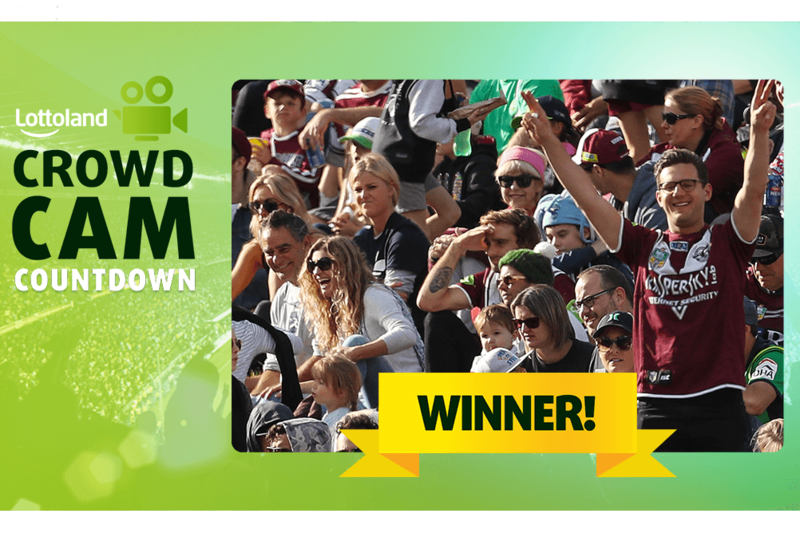 Lottoland's Crowd Cam takes place at every Manly Sea Eagles' home game in 2019 and it could net you up to $1000! At halftime, there will be a camera that pans into the crowd and lands on someone. From that point the countdown begins. The quicker you notice you're on camera, the more money you win! Simple, right? Get on down to Lottoland for each and every Manly Sea Eagles home game this year for your chance to win $1000!